Happy Saturday everyone! I usually don't post on the weekends, but my friend Jessica at Healthy Mommy, Healthy Baby asked me to co-host her Sweet Saturday link party and I am excited to join her! 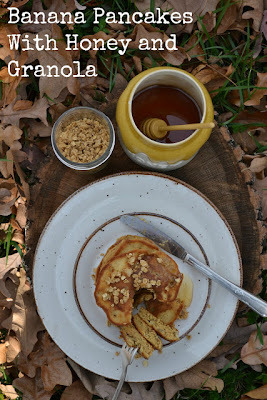 I am linking up my banana pancakes with honey and granola. They are the perfect weekend breakfast with your family and loved ones. Go here to check out the recipe. 1. Link up something sweet to really WOW us all - your blog, Etsy store, Pinterest, Facebook...whatever you want. 2. Link up as many posts as you'd like and please follow me and the hostess, Jessica @ Healthy Mommy, Healthy Baby. Leave us a comment if you are a new follower so we can follow you back! 3. Hop around to different links and say hi. 4. Please share the button or put a text link into the post you are sharing so others can join in the fun as well. Looks great, Tammy! Yummy pancakes! Never thought to put granola on my french toast but you can bet I'm going to try it! I sprinkle it on a lot of things. The pancakes look really great! Thanks for hosting & for visiting & commenting on Saved by Grace! I'm following your lovely blog, & I hope you'll consider following Saved by Grace! I've got to go see the Snickerdoodle Cupcakes... and then likely share them with my mom! Tammy! morning! you have a cute saturday meme. i'll have to remember that. yes, dang it. i broke my camera. it was an accident but i should have been more careful. Thanks for hosting and leaving your lovely comment on my blog! You remind me that I should make some more homemade granola!